Why are gorillas in danger? 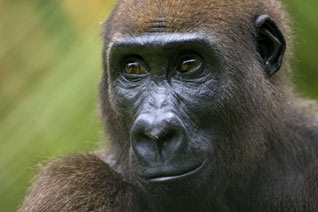 Despite their relatively higher numbers compared to all three other gorilla subspecies, western lowland gorillas have been assigned the critically endangered threat category on the 2008 IUCN red list of threatened species because of the many factors contributing to their empending extinction combined with the species' relatively slow reproductive cycle. Female gorillas become reproductively active at the age of around eight years, whereas males are reproductively active starting at around fifteen years of age. The young are usually weaned from milk at the age of three to four years-old, but remain with their mothers until five to six years of age. Once a female is reproductively active, she can have an offspring every four to five years. This birth interval is required to allow a mother to teach her offspring critical survival skills. civil unrest stemming from political instability. Oil and logging industries are major contributors to Gabon's economy. It is well known that both industries, with logging playing a major role, catalyze commercial hunting and trading of bush meat by opening up roads from deep within the Gabonese forest, by providing transportation of the bush meat from the forest into major cities, and through hunting activities by industry workers on their "time-off". Some logging companies, only two currently in Gabon, attain FSC (Forest Stewardship Council) certification which shows voluntary commitment on their behalf toward sustainable management of their concessions. This FSC label can be found on many forest-derived consumer products.